Siegel Suites Sahara Apartments - Great Amenities and Low Rates! Minimum length of stay and amenities vary by state, city, and property. Rent at Siegel Suites Sahara Apartments for a furnished or unfurnished apartment with a great central Las Vegas location next to Palace Station. Our low cost apartments are walking distance to the famous Las Vegas Strip, with casinos, restaurants, clubs, shopping, golf and more. There are many restaurants that are within walking distance. Some of these include Pizza Hut, In-N-Out Burger, Chick-Fil-A and Soho Sushi Burrito. We rent large, fully furnished or unfurnished studio one bedroom and two bedroom apartments. All apartments are move in ready with full kitchens. Also, we have two sparkling pools for those warm summer months! Rent your apartment today with no long term lease and your choice of low weekly or monthly payment options. Bad credit ok. Your low rent includes free utilities, free cable TV, and more. Get more details below. Then call us toll-free at 1-888-328-0192, locally at 702-830-9650. Also, you can email us to reserve your Las Vegas apartment at Siegel Suites Sahara. 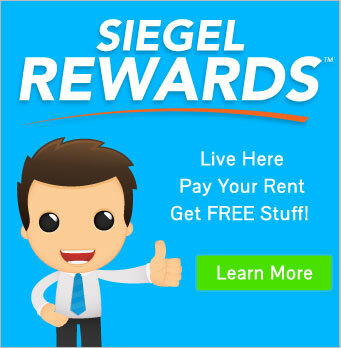 Lastly, another great feature of Siegel Suites is our Siegel Rewards Program. The longer you stay, the less you pay!